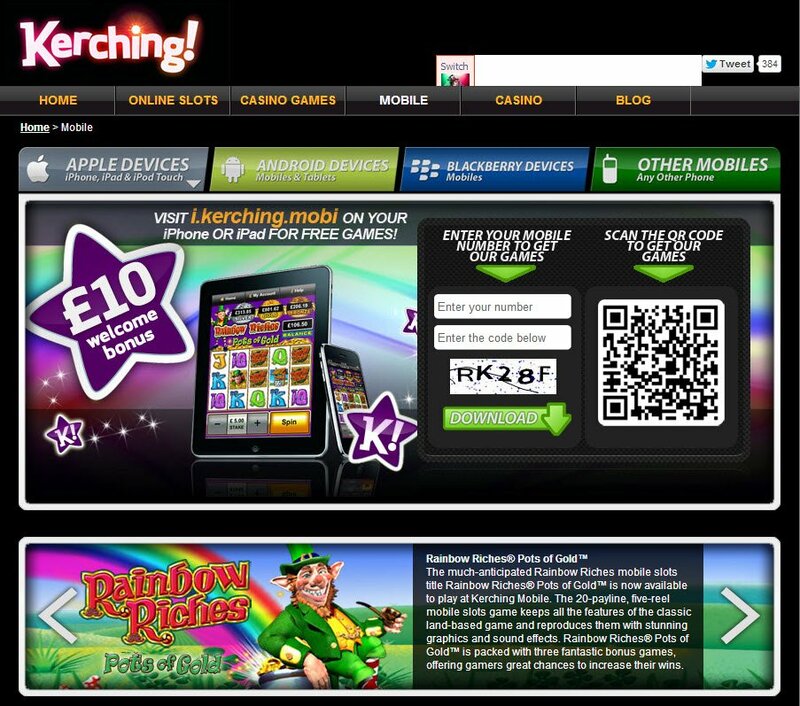 Kerching Casino has been developed as an online casino for UK players. Established in 2000, they are licensed and regulated by The Alderney Gambling Control Commission. Kerching Casino says "Whether you want white-knuckled, high stakes action, or a low-risk, casual diversion, Kerching Casino is your destination!" I'm going to put that notion to the test, in this Kerching Casino review. Downloading Kerching Casino is not an option, all the slot games and table games are available to play in your browser, just there waiting for you to click and play! Registration is so quick and easy, writing this sentence about registering is actually taking me longer than it took me to sign up to Kerching Casino. Games load quickly, depending on your internet speed and connection. An instant play Kerching Casino might even be the answer to slow downloading of games due to patchy internet. As a strong British online casino, payment options are varied and you have all the options you would expect to see, plus a few you may not have thought of. Kerching Casino is an IGT casino, which respectively uses WagerWare software. Having dragged my increasingly weary eyes through all the technical information, and the fair play security monitoring and testing, I can say without a doubt you are in good hands with this online casino. Kerching explains in detail how it adheres to stringent regulations, so they can be sure of treating all their players fairly. There is a nice range of Kerching Casino slot games available, with some pretty interesting themes and nifty bonus features. I must admit my love for IGT's Ghostbusters slot, there's just something about that little green slimy blob that makes me happy. I'm a big Blackjack fan myself, and this IGT casino table game is represented very nicely indeed. It's simply infinitely playable; in my humble opinion. There's a nice Kerching Casino welcome bonus, guaranteed to put some zing into your wagering pockets. A 100% price match up to £100. If you ever get that midweek slump, where you're far away from the weekend to come, and you've forgotten the feeling from the previous weekend, you'll be in luck with the daily promotions on offer at this online casino. Every day there's something to bring some sunshine into your life. For me, Tuesday is usually my day when I need a something to cheer me up, and a cash match on all slots is certainly bound to do the trick. For those Wednesday blues, there is 10% cashback on any losses up to £50. Friday is always going to be here soon, and then you'll enjoy that cash match on all slots again. Thursday and Saturday, two of my favourite days, will give you 100% cash match on deposits up to £50. As a strong British online casino, payment options are varied, and you have all the options you would expect to see, plus a few you may not have thought of. Withdrawal isn't possible to all the same deposit methods, but there is definitely enough variation to enable you to withdraw your Kerching Casino winnings easily. Customer Service is available via telephone (a 0845 number, costing money to call and definitely not included as a local or national call on your mobile phone monthly plan), via email and via texting an SMS code, again costing money. The Live Chat option is only available between certain hours, leaves a bad taste in my mouth. Is there a VIP program at Kerching Casino? 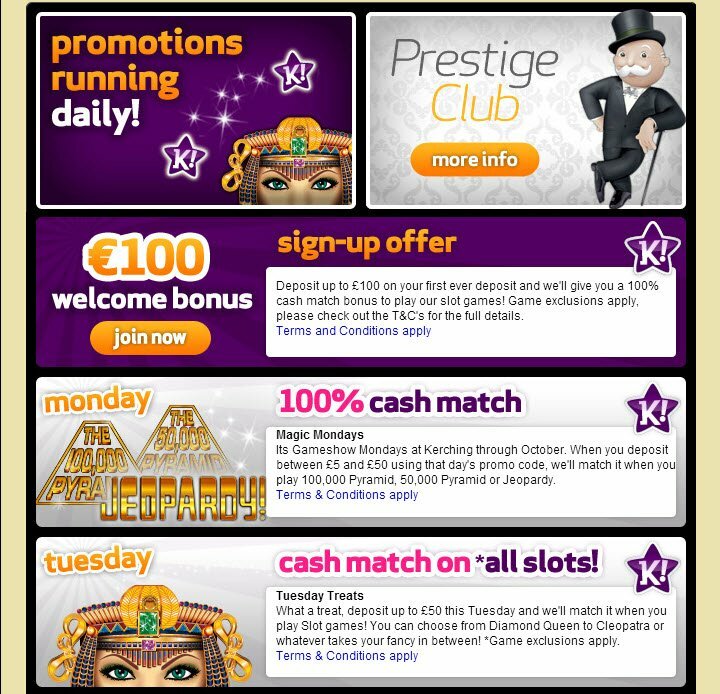 Yes – Kerching Casino has a VIP Program called Prestige Club. They have different levels: Bronze, Silver, Gold, and Platinum based on how much you play. Rewards include welcome cash bonuses. enhanced weekly offers, weekly prize drawings, exclusive challenges, new game bonuses, loyalty points, gifts, monthly bonuses, and more.